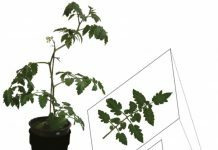 Over Christmas, a couple of papers came out that suggest plants can respond to airborne sound waves. The findings challenge many ideas about how plants respond to sound. If a tree falls in a forest, can another tree hear it? There’s a lot said about plants’ responses to noise, but sometimes it can be misleading. Researchers found that trees shunned noisier habitats. However, the reason wasn’t that the trees could hear the noise, it was because the animals carrying their seeds could. The animals avoided the noise, and so the next generation of trees grew in quieter areas, giving the impression the plants were reacting. So while there’s plenty to research on the interaction between sound and plants, it’s not always a simple relationship. 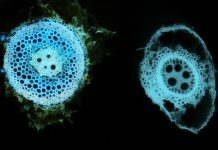 More recently, Gagliano and colleagues found that the roots of peas could locate water based on sound alone. Gagliano’s team controlled for the obvious cue – moisture gradient – and also tested the roots with recordings of water and white noise. Interestingly, the authors report that while the roots were attracted to the sound of running water, they were repulsed by recordings of the sound of running water. That’s a puzzle, but also shows that they’re not selectively reporting evidence to back up their hypothesis. They also found that when there was a moisture gradient, that took precedence over any sound cues. 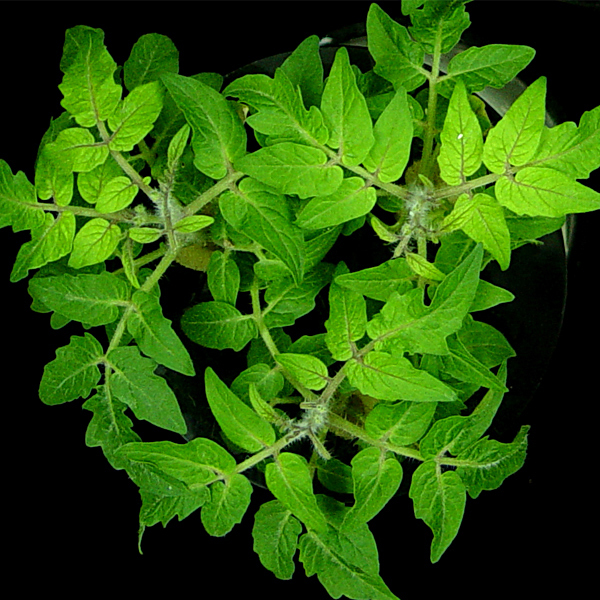 Their work has been cited in research by other scientists in Arabidopsis and other plants. While suggesting roots hear is a novel suggestion, the experiments show why no one had been able to show it till now. There’s also a clear benefit to fitness for a plant to hear. My only concern is that the test was around at 105 dB. This intensity seems loud to me, but I’m not familiar with sound in soil environments. Even if this is too loud to be of use in natural settings, there’s still plenty to explain as to why the roots are responding to the sound. Over Christmas, there were a couple of papers posted to bioRxiv on sound and plants. Ed Yong has written up an excellent article on the two papers, including the caveat that these are pre-prints. The paper Flowers respond to pollinator sound within minutes by increasing nectar sugar concentration by Veits and colleagues interested me as there’s careful consideration of what a pollinator sounds like. Different frequencies and intensities were used. A bee hovering above a flower was considered to be 75dB, and lower at 95dB. This sound also seemed loud to me, but remembering the noise a fly makes when it buzzes into your ear made me think again. The frequency of a bee or moth is a more difficult tone to reproduce. What kind of pollinator do you use, and which frequencies matter? So while I can see the importance of a ‘real-world’ sound, like a buzz, I also like that the experiments were done with simple tones too, with a low tone of 1kHz, Intermediate of 35kHz and High at 160 kHz. Crucially, she says, the study is “ecologically relevant”—that is, it involves a sound (bee buzzes) and a response (nectar sweetening) that actually matter to the plant. It’s a far cry from past studies that showed plants reacting to sounds they would never normally encounter, such as classical music, in ways that are hard to interpret (certain genes might switch on or off, but to what end?). There was a paper published in the December issue of Annals of Botany, and while there was a lot I liked in it, that question to what end? was bothering me. 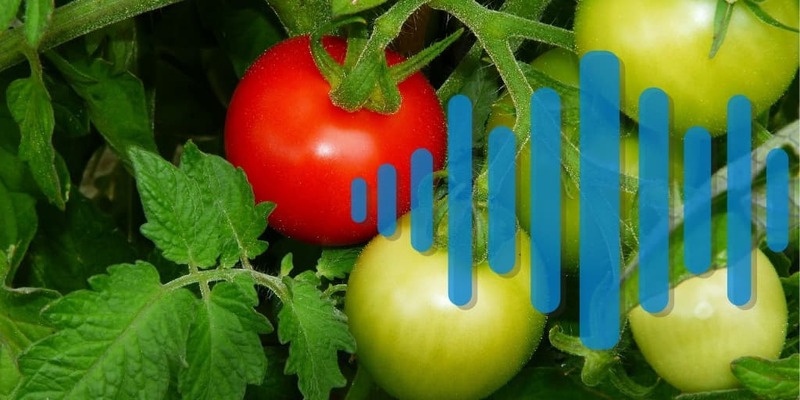 The paper is Exploring the sound-modulated delay in tomato ripening through expression analysis of coding and non-coding RNAs by Kim et al. The authors found that exposing tomatoes to sound for just six hours could delay ripening of the fruits. I was stuck to understand why a plant would react that way to sound, but there was a lot I liked in the article. This paper that came out before the Veits pre-print also doesn’t leave ‘sound’ as a vague concept, Kim’s team is very clear about what sound they mean. The other was the expression analysis. But why would sound have that effect? The sound in question is a tone at 80dB at the speaker in a soundproofed growth chamber. The frequency is 1kHz. In other words, the same tone that the Tel-Aviv team used to investigate flowers also affects fruit. Just like the tone has more than one effect, it’s also true for the chemicals the Kim paper identifies. 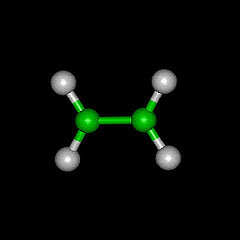 The hormone that immediately leapt out at me was ethylene. 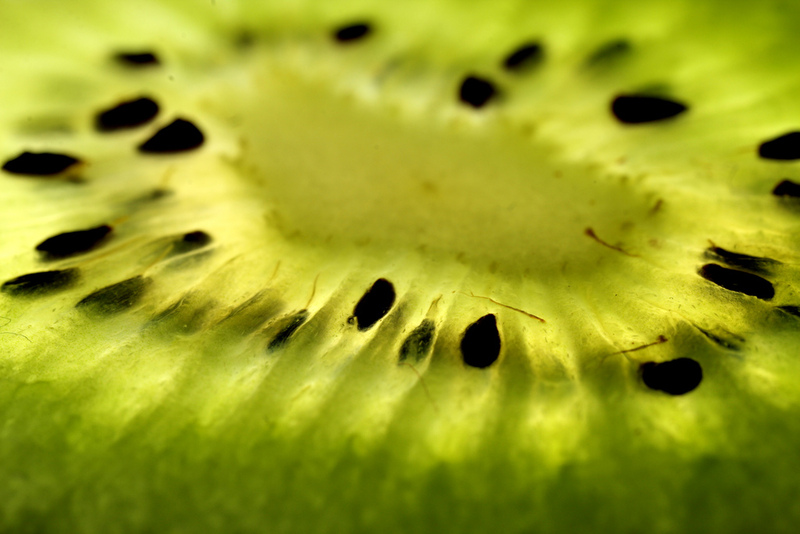 Ethylene helps ripen fruit, but that’s not all. Horticulturalists can find ethylene a nuisance because it can cause flowers to die. There could be quite a benefit to fitness if a bee’s buzz reduced ethylene production, as it would signal there are still pollinators about and it’s worth keeping a floral display going. If there are no pollinators around, then flowers are expensive organs to keep, and it’s to the plant’s benefit to lose them. Looking at what the plant increases, flavonoid, phenylpropanoid and glucans, there are possible benefits to flowers in producing more of them. Flavonoids are often pigments in flowers, though they have other functions too. Also have plenty of functions, including pigments and scent in flowers. Glucans can play a role in allowing the pollen tube to access the ovule, which is convenient if you know fresh pollen is arriving. Hormones are often multi-functional, so there is a danger that picking out some effects and ignoring others is a bit like spotting patterns in clouds. If you haven’t guessed, what I’m saying here is highly speculative, but Kim’s team have found that a 1kHz sound can change gene expression in a way that could benefit floral display. Once the display is over, and the flower becomes the fruit, the genetic and hormonal machinery is still around and be used to delay ripening. That could mean plants haven’t dismantled the equipment after flowering because it’s never triggered again and so never a problem. Kim et al. cite support for the idea of some sort of general response to sound in their paper, referring back to Chuanren et al.’s work on germinating Echinacea angustifolia seeds. Those authors found that a 100dB sound could help germinate dormant seeds if the frequency was at 1000Hz, which is the same 1kHz tone. 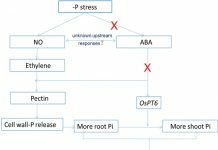 It would seem that a plant’s response to a 1kHz tone is complicated and if Veits and colleagues are right, rapid. It would be interesting to see if gene expression could be tracked over time to see if there are both short-term and long-term responses, and how they interact. I’d also be fascinated to know if ethylene production is cut when a plant is in flower as a response to buzzing. Coming back to Gagliano’s work, there’s the problem that running water doesn’t have a pure tone. It is noisy, but what kind of noise? White noise is noise that’s even across all frequencies, the typical static hiss you get on an untuned radio, and it’s the noise used in the Gagliano paper. There are other colours of noise. Pink noise is like white noise, with a bias toward lower frequencies, because of how the human ear hears different frequencies. A variation on pink noise is brown, or red noise. This has a bigger bias towards lower frequencies, and it might sound familiar. It might be interesting to re-run Gagliano’s experiment with different colours of noise including blue and violet. If there’s a bias towards brown, and this could be tracked in gene expression, then this could be more evidence for a plant response to lower frequency sounds. Previous articleBring on the birch!